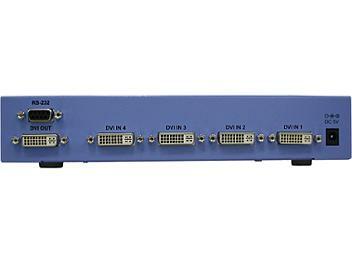 The Y-102D4 DVI Switcher is a high performance switching box with remote. It is to be placed between your various DVI input sources and DVI display monitor. Simply pressing a button on the remote you can select your desired DVI source for display on the DVI monitor. HDCP 1.1 and DVI1.0 compliant. The unit has the function of signal enhancer to improve signal quality after long distance transmission. Ideal for home theater integration. - HDTV : 480i, 576i, 480p, 576p, 720p, 1080i and 1080p @60Hz.